My cousin, the late Father Gerry Reynolds CSsR, features on the cover of the January/February 2016 edition of the magazine Reality. 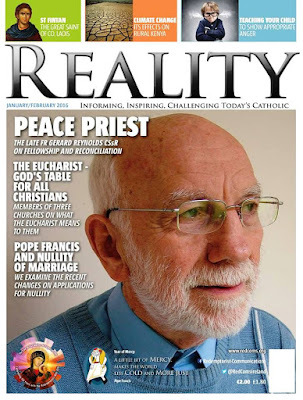 This is the last edition of Reality published by Redemptorist Communications from Marianella, the Redemptorist community house in Rathgar. Reality is edited by Father Brendan McConvery, who was once my lecturer in New Testament studies. He recalls the late Canon Jim Hartin in his editorial. When he was Principal of the Church of Ireland Theological College, Jim joked that his neighbours on Orwell Road included Reds at both ends of the road: the Redemptorists at one end, and the Soviet Embassy (now the Russian Embassy) at the other. 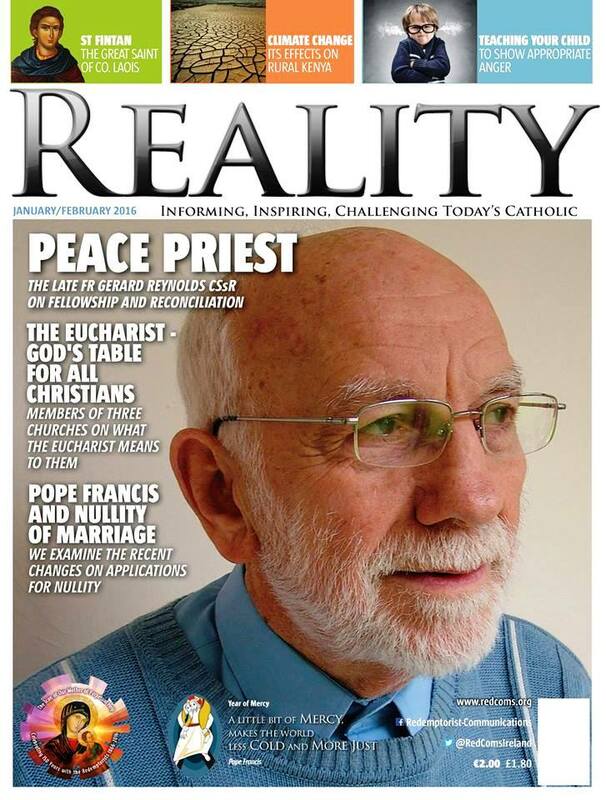 This edition of Reality has an ecumenical flavour to mark the Week of Prayer for Christian Unity. Members of three Christian traditions – Anglican, Methodist and Presbyterian – describe how we celebrate the Lord’s Supper and what it means to us. I was invited to contribute from an Anglican perspective, and Brendan McConvery describes this as “a very enlightening collection.” The Methodist contribution is made by Gillian Kingston, while the Revd Dr Katherine Meyer introduces the reader to a typical Presbyterian celebration of the Lord’s Supper. Gerry was a cousin – I think a second or third cousin – on my mother’s side of the family, and we last met when we both took part in the funeral of a mutual cousin and shared Eucharistic hospitality. He was born on a farm in Mungret, Co Limerick, on 18 March 1933 and died on 30 November 2015 in the Royal Victoria Hospital in Belfast. He was based at the Redemptorists’ Clonard Monastery in Belfast for more than 30 years. Gerry’s family was steeped in the ways of the Redemptorists, two of his uncles were priests in the order, as is his brother, Father Patrick Reynolds. He first considered joining the Kiltegan Fathers and joining their foreign mission. However, his uncles – one of whom was also Father Gerry Reynolds and was based in Clonar Monastery – persuaded him to change his mind and join the Redemptorists. He studied at University College Galway and then studied theology before he was ordained in 1960. He spent over 20 years working in various ministries, was appointed the Redemptorist Rector in Limerick in 1975, and later moved to Athenry, Co Galway, before moving to Clonard in 1983. He influenced many people through his Ecumenical, Peace and Reconciliation ministries. He was well known for his cross-community work and efforts to tackle sectarianism. One of his close ecumenical partners was the Revd Ken Newell of Fitzroy Presbyterian Church, and they shared mutual joy when the international Pax Christi Award was presented to the Clonard-Fitzroy Fellowship in 1999. It is a pleasure to join him again in this creative way in the pages of Reality magazine during this Week of Prayer for Christian Unity.